After seven months, 80 games, 52 flights and too many bus rides to count, the Portland Trail Blazers arrive at the last week of the 2018-19 regular season sitting in fourth-place in the Western Conference. 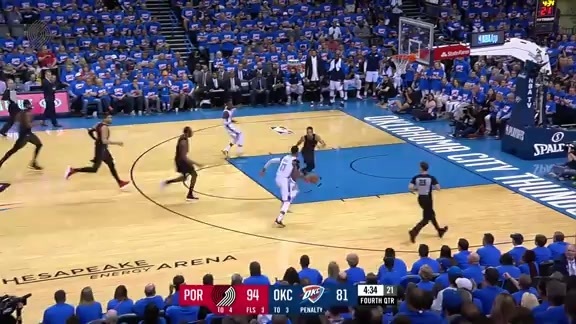 Along the way, Portland won 51 games, vastly exceeded expectations and moving Terry Stotts into third in team history in wins, Damian Lillard cemented his status as one of the greatest players in franchise history while moving up the ledger in various statistical categories, Jusuf Nurkic proved himself worthy of All-Star consideration before the... unpleasantness, CJ McCollum, Evan Turner and Nurkic each logged triple-doubles after the team went over five seasons without one, Maurice Harkless returned to form, Al-Farqou Aminu's fans formed a hive, Jake Layman came into his own, Seth Curry reestablished himself as one of the NBA's most accurate shooters, Zach Collins make progress in fits and starts, Neil Olshey brought in Rodney Hood and Enes Kanter in moves that likely saved Portland's seasons and Skal Labisseire, Anfernee Simons and Gary Trent Jr. all put in considerable work on the practice court. As far as regular seasons go, the Trail Blazers had a great one. 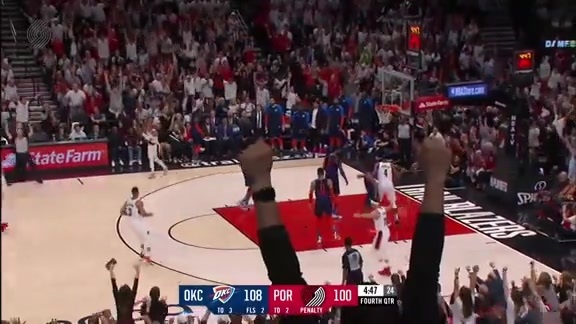 They'll need to exercise some recent playoff demons in order to quiet their critics, but under any objective measure, Portland's 2018-19 regular season has been a resounding success. The Blazers are sitting on the fourth seed in the Western Conference with two games remaining. Portland got some great news, getting guard CJ McCollum back after he missed 10 games with a knee injury. Even with McCollum out, All-Star Damian Lillard led Portland to an 8-2 record over that span. The Blazers are behind the 76ers at No. 7 and ahead of the Celtics at No. 9. The Blazers went 8-2 without C.J. McCollum, who returned to log 25 minutes in their win against Denver on Sunday. Four of those eight wins (and both losses) came after Jusuf Nurkic's season-ending injury. Enes Kanter has averaged 17.6 points (on 62 percent shooting) and 10.7 rebounds in his seven games as a starter and, more importantly, the Blazers have allowed just a point per possession in his 198 minutes on the floor over that stretch. Of course, four of the seven opponents had bottom-10 offenses. The only top-10 offense the Blazers faced over that stretch was that of the Nuggets, who rested three starters in the second of their two weekend meetings. It's very likely that the No. 4-5 series in the West is Portland-Utah, but the Blazers need one more win (or a Utah loss) to clinch home-court advantage. In splitting the season series, both the Blazers and Jazz won on each other's home floor. The Blazers inched closer to securing home-court advantage in round one of the playoffs by beating the Nuggets on Sunday. Just as importantly, they welcomed C.J. McCollum (left leg) back into game action. C.J. returned to the starting lineup and tallied nine points, nine rebounds and six assists in 25 minutes. Beer has the Trail Blazers behind the 76ers at No. 7 and ahead of the Celtics at No. 9. They’re an elite offense with Damian Lillard and CJ McCollum at the helm. They performed as a middle-of-the-road defense for much of the year. We go into the postseason wondering if that offense can show up and overcome shortcomings of the defense. It has a little bit in the past, but we also have the debacle against New Orleans from last year fresh in our minds. The thing that hurts the most about trying to see if they can be better in the postseason is losing Jusuf Nurkic to that gruesome injury. It’s crazy to think if that game ends in regulation or the first overtime, that injury never happens. The Blazers can be pretty resilient when dealing with injuries, but this is asking too much to overcome inside. Nurkic was having a great year. Harper has the Trail Blazers behind the 76ers at No. 6 and ahead of the Jazz at No. 8. Best Case: Damian Lillard and C.J. McCollum take over a series and the Blazers senak into the second round where they get bounced in six. Worst Case: Losing Jusuf Nurkic proves to be entirely too much and Portland gets swept out the first round again. 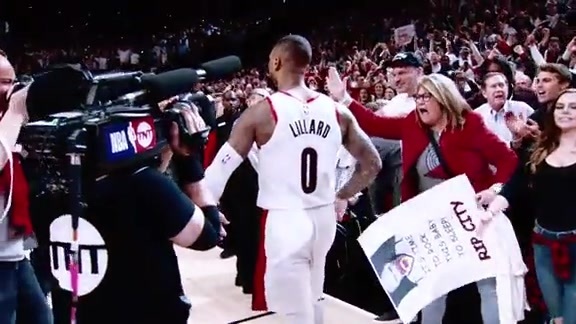 Prediction: Dame has been too good this to get swept again. But without Nurkic, the Trail Blazers don’t last more than five or six games. C.J. then spends the summer saying “I told you so” to Kevin Durant about how Portland could have benefited from signing Boogie and Nurk last summer. Rollins has the Trail Blazers behind the Nuggets at No. 7 and ahead of the Thunder at No. 9. Even without Jusuf Nurkic and CJ McCollum, the Blazers went 3-1 on a recent road trip through the East. With so much of Portland's top-end talent missing, the team's continued run has an unsustainable feel. But the Blazers are winning, and with McCollum's return date from a knee injury still uncertain (but looking possible before the playoffs), they'll have to keep doing it with help from unlikely sources. Examples: Rodney Hood led Portland with 21 points in Monday's 132-122 win against Minnesota, and Enes Kanter (still allergic to defense) has been a reliable source of scoring and rebounding. He's on a run of three straight games with at least 20 points and 10 boards. Let's not forget Evan Turner, who recorded a pair of triple-doubles this week. It seemed unlikely when Nurkic joined McCollum on the shelf with a leg injury, but the Blazers are looking like a good bet to retain home-court advantage in their first-round series. Hughes has the Trail Blazers behind the Clippers at No. 8 and ahead of the Celtics at No. 10.